Sandford Cascade participants: Creswell Crags Museum and Heritage Centre, Bassetlaw Museum, Belton House, Boughton House, Bosworth Battlefield Heritage Centre, Derby Museum and Art Gallery, International Bomber Command Centre, National Civil War Centre, National Justice Museum, , Southwell Minster and the Arch Bishop's Palace and The Workhouse, Southwell were among 49 museums and heritage sites across the British Isles who received a Sandford Award in recognition of their high quality learning provision. The ceremony took place on 19 November at the Tower of London. These two sessions delivered by Cultural Learning and part of our CPD calendar of events for project participants, were packed full of brilliant tips and expert advice on how museums and heritage sites can be creative and stand out from the crowd when it comes to marketing their learning offer to schools. We also learnt that piloting new resources with local schools will quickly highlight learning value and there were opportunities to discuss and share ideas and talk about what works well in our own settings. The education team at Sandford Award winning Cromford Mills in Derbyshire helped us to recreate the Sandford Award judging process and assessment visit for our series of Sandford Cascade filmshorts. The film will be edited and shots will be pieced together with a recording of our Sandford Award application master class filmed last year. This will create a support tool for heritage sites wishing to apply for a Sandford Award. Here's our CEO of the Heritage Education Trust recording a new promotional film with our local media partner Blink Creative to coincide with the 40th anniversary of the Sandford Award. This was a really useful session exploring and sharing ideas around working with families facilitated by the Learning and Community Officer at Belton House- our partner site. Just one of the many development activities offered free to project participants this year. We kicked off the new year by delivering a very successful information session at our Supporter site- Belton House with the support of one of our SAIL participants- Lincolnshire Road Transport Museum. The session generated a lot of interest and as a result more heritage sites in the East Midlands will benefit from our community of best practice through bursaries, good practice visits and a programme of development activities. The Cascade team were thrilled to showcase this year's good practice in heritage education films at the 2017 Sandford Award Ceremony at the Fashion Museum and Assembly Rooms, Bath. We were delighted that one of our project members- Mansfield Museum were among the 39 heritage sites receiving their award for high quality learning provision. Project participants attended Dementia Friendly training delivered by Lincoln Co-operative at Bishop Grosseteste University in Lincoln. The aim of the session was to raise awareness, understanding how we can engage with people living with dementia and the important role museums play in the mental health and wellbeing of their communities. As a token of our appreciation we treated our Supporter sites to an afternoon at Hampton Court Palace where we met the Chief Curator of Historic Royal Palaces for a talk and behind the scenes tour of the Palace. We also met a member of the HRP learning team and were amazed to discover that the room we had lunch in was the room in which Jane Seymour gave birth to Edward VI in 1537! 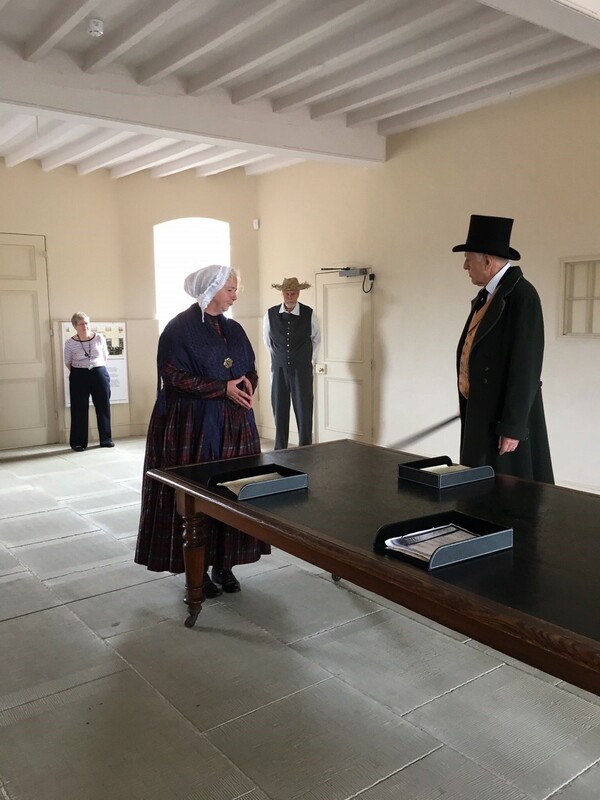 We enjoyed an inspiring costumed role play workshop delivered by the learning team at The Workhouse, Southwell on the 10 August. Sandford Cascade Advancers and SAIL participants picked up some great tips on researching period dress and making costumes for adults and children. Lincoln Cathedral was the backdrop to our last day of filming where we shadowed a delightful year 6 group from the Lincoln Minster School. Education and Outreach Officer, Sally, shared best practice with a focus on teacher consultation and evaluation and how this impacts on delivering a quality service to visitors. What did children from Lincoln Fields Primary think of "Written in bone"- a new archaeology workshop trialled by the learning team at the Museum of London? 'Fun and exciting' was the unanimous verdict, captured on film for our next 'Sandford Short' e-tutorial featuring best practice in consultation and evaluation. Filming for our next round of Cascade good practice films, Sandford Shorts, is underway. Our first day of filming found us with Sandford Award Judges Julie Taylor and Judi Jones in the Teacher's Resource Centre at Bishop Grosseteste University Library. The focus of this year's films is Sandford Award criteria 3 - consultation with education stakeholders and National Curriculum links. We will be able to provide some expert insights and good practice examples of what is expected against this criteria, as filming on location this year will also take place at Lincoln Cathedral and the Museum of London. The team were transported to the 1840's at Sandford Award winning site- The Workhouse in Nottinghamshire where we observed a very engaging KS2 session involving immersive role play. Prior to the children's visit, the year 5 group were given the name of a child who was really there. On their arrival, Master or Matron then ‘admitted’ them into The Workhouse and asked them their name, age and reason for going there. Pupils finished the day by taking part in a debate which sparked some really interesting discussions! The Workhouse will host our next recruitment workshop on Tuesday 9 May 2017- open to heritage sites across the East Midlands. See News and Events page for more information and booking details.